My dear, he was everywhere. You couldn’t miss him in those heady Tudor days when kings changed with the winds of fate and haunting stories were being minted with bewildering speed. The days Shakespeare later plundered were lived out by this man who towered above the crowd: quite literally. For Lord John Cheney was two metres tall. Cheney began a staunch supporter of the House of York. When Edward IV and Elizabeth Woodville were crowned , he was there in the pews. In fact, Edward made him a Knight of the Bath that very day. That was in 1461. By 1483, Richard III had exuded his personal charm so thoroughly that Cheney had opted to leave the Yorkist ranks for Lancaster and the Duke of Buckingham, leading Salisbury in an uprising later honoured by that chain you see round his effigy’s alabaster neck as it lies in Salisbury Cathedral. The rebellion failed; and he sailed out to Brittany, to join Henry Tudor in his preparations for invasion. Two metres tall? Who better for Henry to choose as his bodyguard. And the knight was a strong and valiant fighter, recovering the standard at Bosworth after its bearer fell, wounded by Richard III himself before the king fell to be buried ignominiously beneath a municipal car park. You’d keep him close, wouldn’t you, at a strapping two metres; and not risk challenge, even if you were shrewd King Henry. And Cheney became a Lord , and then a Master of the House, and a Knight of the Garter and Privy Councillor. Even minor giants can find their stature to their advantage. He lived in a world of lilliputian munchkins.But death comes to us all, and I note tourists per the centuries have dared to carve their name on his vast marble bulk, impressive and exquisitely dressed and carved as it is. A great leveller, death. Though such splendid immortality, lying resplendent in Salisbury Cathedral, with tourists gawping and voracious bloggers googling right there at his side: it does seem enviable. Posted in Quirks of HistoryTagged anglophile, Britain, Edward IV, england, Henry, Henry VII. Richard III, history, Lord John Cheney, Salisbury CathedralBookmark the permalink. According to this study: http://researchnews.osu.edu/archive/medimen.htm: average height in those days was 173.4cm, Stephen; this gentleman had a fair amount on most of them! He seems to be resting his feet on the dog, poor dog. I know the average height was less back in that time than it is now; as a matter of fact when my 1.73-meter height is made to seem below average by my contemporaries I will often reply to the effect that I’m rather quite tall for the 18th century. But for a man to stand a full two meters in the 15th must have been an impressive advantage indeed. I wonder if he had some sort of giant DNA! Preliminary research suggests the average height at that time was 1.73 metres, Rob 9http://researchnews.osu.edu/archive/medimen.htm: ). Though all the doors from that time which exist in buildings here seem mighty low for that to be the case. Maybe they just liked stooping….still, that would give Lord Cheney 27cm on everyone else…. Ach, doomed to be forever average! My father was almost as tall, and my brother even taller. I grew up around tall people, for everyone in my family was tall. Perhaps that is why I love tall stories, which are much different than tall tales. Thank you for sharing your tall story! 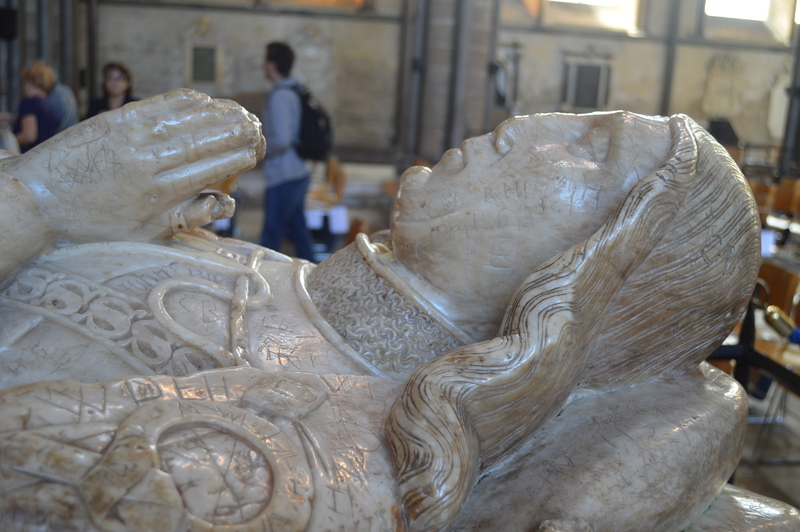 Edward IV and Elizabeth Woodville married in secret, so I doubt this fellow was not in the pews. Perhaps you mean he attended Elizabeth’s coronation? If not, what source is there that Cheney was present at E4’s and EW’s wedding? Wednesday, thank you, you are perfectly right. All changed. I’ve seen the plaster copy at the V&A, but I so want to see the original at Fontevraud. Another fascinating footnote from history, thanks! Just noted that, what with the Puritan penchant for bashing out noses, his profile now gives him an almost Native American look. Brave indeed! He was Amazing tall knight .I’ve always loved the history of royalty even before i found out i was related to royalty and Sir John Cheney and his descendeds. I see half the world is claiming to be descendants of medieval nobles again, but they never seem to have genealogical proof, funny that, but rather boring!!! It appears 7 million have an indirect blood line to the true “Warrior King” who knocked Cheyney off his horse. Americans are all descendants of English nobles so I understand. Hi John – thanks for commenting – you have a very good point. We’re all related to a Holy Roman Emperor too, Charlemagne, if the genes don’t lie.